Is that the same C clip that I will run into doing the " 30 minute" cv boot job? The C clip that is required to be removed before the wheel bearing can be removed can be seen at 4:45 into this video. SO this is the VALUE LINE of parts. AND I was told before that it means the parts are NOT as durable/long life as normal parts are... Like the Value Line brake pads/rotors...just not as good as the part that was originally installed on the car from factory. So I'd be inclined to buy the parts separately for a few dollars more and then you know you're getting the factory part. FCPEuro = $38.69 on sale for FAG bearings. Exact OE part. 2 purchased thank you for less than 1/2 price of 1 Value Line kit. I recently used FAG bearing kits (which include new bearings, bolts and axle nuts) on my '05 Golf (front) and '05 X5 (rear) - not the cheapest parts I could get but a lot less than either dealer would charge. And of course in both cases FAG is OEM. This is not a job I want to cut corners on in terms of part quality!!! Both kits were made in Europe. I got the front Golf bearing kit ex Singapore for NZ$140 inc freight, which was a bargin actually, as this kit includes a pre-installed hub as well as the bearing etc. The X5 rear bearing kit was available here in NZ and cost $170 including freight. I hate to think what these jobs would have cost at the shop. I approached a local Indy for a quote and was told that rear bearings rarely fail, so it was likely to be the front, the bearing was NZ$250 and they wouldn't quote on labour as they had never done one before and wouldn't guess on the time required. So I spent another NZ$400 on tools and did them myself. Not an easy job but I took my time and had few issues. Things are TIGHT on these bearings but with the correct tools and techniques it all went pretty smoothly. When/if I do a front bearing, I'll have to get some addition tools as the only bearing removal tool I could get doesn't have a receiver large enough for the X5 front - it only goes up to 91mm and you need one about 100mm or so. I'll get a local engineering firm to make me up a custom receiver when/if I tackle a front bearing. FYI Timken is just re-boxed OEM hubs/bearings they buy from local dealerships and mark up. Always go OEM especially when it comes to the DSC. BMW dealership told me a year ago and when I asked my ex BMW dealership indy last week to reconfirm he said the exact same thing. lesser quality parts sold in common repair packages. Years ago, I purchased a service kit that had both the OE oil and charcoal cabin filter. 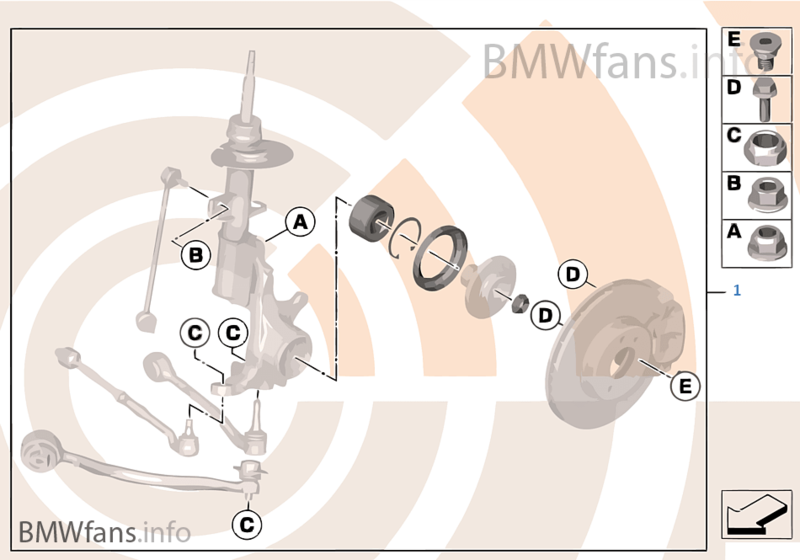 It does seem clear that BMW offer kits to reduce the cost of maint. but it may be that the saving is in bulk purchasing and not lower quality parts. For example, the turbo unit for my diesel is ONLY available as a "value line " kit, as it includes all the extra parts that should be changed with the turbo (god forbid!!!) like seals, bolts, oil lines etc. The turbo unit itself is the same Garrett GT2260V unit from the factory. Last edited by wpoll; 02-08-2019 at 10:09 PM.